Forrester Research released their latest version of the Forrester Wave Email Marketing Email Marketing Service Providers report q2 2018. The Wave report gives an overview of how participating email service providers in the Enterprise segment for B2C marketing rank compared to each other. The Wave places the email service providers in 4 categories based on their Offering and Strategy. 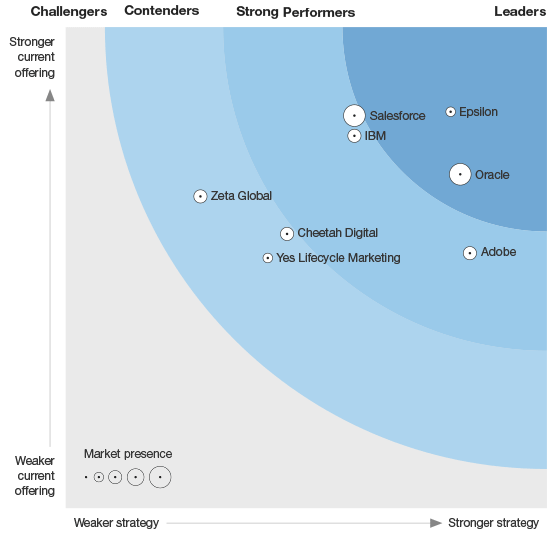 The Forrester Wave scores the email marketing software providers based on current offering and strategy and then plots them in the Wave graph. The final ranking labels the vendors as either “Leaders,” “Strong performers”, “Contenders” or “Challengers”. There are no vendors marked Challengers this wave report, so all participants can be happy. In the Forrester email marketing service providers report the scores are translated to the Wave graph. You can see the 2018 Wave graph in full size. Forrester included 8 email marketing software solutions vendors in the report – looking at enterprise-level email marketing vendors. In 2018 Forrester inspected the email marketing service providers through a product demo’s. They also interviewed 3 email marketers (customer references). And each vendor presented their vision / competitive positioning in a 3 hour in-person meeting. This time 8 Email Service Providers were included. (We list more than 400 email service providers, although not all Enterprise, of course). The chapter – “Evaluated Vendors And Inclusion Criteria” lists the selection criteria. Send marketing emails with a proprietary engine. Earn at least $200 million annually from email marketing. Pitch against other enterprise email deployment vendors. Email service providers may choose not to be included. For comparison, the criteria for inclusion the 2016 report asked for a $60 million revenue from email, 30% representation in Enterprise customers and did not have the requirement to compete / pitch against other enterprise email service providers. In the report, several examples of vendors that were not included are named. Liveclicker and Persado as vendors that do personalization but not sending. Cordial and CRM systems as platforms that send email but not as a dedicated product. Listrak and Copernica as vendors that serve small and mid-sized clients. Sendgrid and Marketo who are not competing with the same email marketing use cases. As Axciom Impact was acquired by Zeta Global, we don’t see there name in the Wave anymore. Private equity firm Vector Capital has rebranded Experian’s cross-channel marketing business as Cheetah Digital. Vector acquired a majority stake in Experian marketing technology in April 2017. Not included in this Wave, compared to 2016 are Selligent Marketing Cloud and SmartFocus Messaging cloud. Back into the overview is Zeta Global with ZetaHub 2, who was in the overview last in 2014. Remarkable is that the online customer survey is no longer a part of the research. This also explains why customer satisfaction can’t be found as an evaluation criteria anymore. The report lacks client feedback on their vendors and the market. Earlier reports did have an “Email Marketing Services Customer Reference Survey”. This is not a trend in a all reports, other Waves like the Cross-Channel Campaign management (CCM) Wave from Q1 2018 did include a customer survey. With so many moving parts, making an overview like the Forrester Wave is probably equal parts art and science. Make sure if you plan to use Forrester Wave report, you use your own weighing and scoring and see it as an additional source informing your decisions, rather than the only source. If you want to see and download the full pdf Forrester Wave Email Marketing report, it can be downloaded here, courtesy of Epsilon. (registration required) or here courtesy of Oracle.